Body and Mind do affect each other. Physical afflictions do affect mind. Stress and other mind issues like nervousness, low mood, poor sleep and lack of focus do affect physical wellbeing. 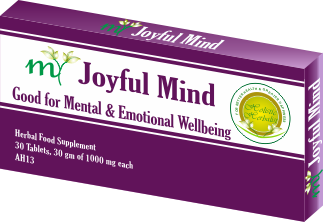 My Joyful Mind is the Ayurvedic supplement containing safe and acclaimed nootropic and adaptogenic herbs that helps with mind health in a unique, balanced and natural manner. Method of Use: Take 1 tablet 2-3 times a day. Buy My Joyful Mind Now! You have some chronic disorder and find that increased physical and mental stress works like a trigger for the disease. This happens in ulcers, autoimmune disorders and other long lasting health issues. You are a women and find yourself having stress, nervousness and low mood during periods or somewhere in menstrual cycle, almost every month. If you say Yes to any of these, you should give a try to natural Ayurvedic herbs for mind health. I have been an educator of Ayurveda for over 3 decades in three countries. I used several supplements of Holistic Herbalist. These are simply superb and offer great health benefits. YES, I have Decided to Benefit with Natural Herbs for Mind Health! Why Could This Ayurvedic Herbal Supplement be Helpful in All these conditions? This is a very valid and appropriate question. 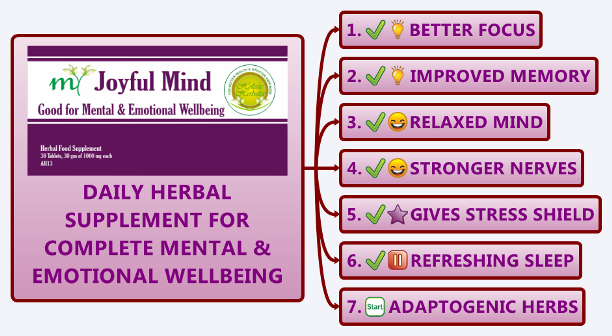 My Joyful Mind contains a few groups of herbs that are carefully selected to affect mind health in these ways. Nootropic Herbs: This is very valuable term and stands for herbs that act as a tonic for brain and nerves. In Ayurveda, Medhya herbs is a similar term that had been used for thousands of years for herbs enhancing mind health naturally. Adaptogenic Herbs: Most of the herbs of this synergistic formulations are adaptogenic. These help you to cope with stress. Gradually, you would find yourself not easily stressed or burdened down or overwhelmed by the conditions or situations that might have you feel stressed upon using these nootropic herbs. The Ayurvedic herbs takes care of bringing the balance of these 3 principles. That is why you see the beneficial effect on mind health in a variety of ways - on stress, nervousness, undesirable outbursts of feelings and emotions, low mood and poor sleep. And this is the underlying reason why these herbs are also great even for healthy persons. All members of my family do take this natural product, irrespective of their age - kids, men and women and seniors. YES, I Buy My Joyful Mind, Now! Many medical drugs do appear to have immediate pacifying or suppressing or numbing effect whether you are taking for nervousness or low mood or poor sleep. These are actually very strong chemicals. Their side effects profile is frightening when one have to use these drugs for mental health issues for long term. Many long term studies even claim that there is almost no significant benefit of using anti-anxiety and antidepressant drugs for long term use. When you consider dietary supplements, Vitamins, especially B group of vitamins, calcium, magnesium and an overall balanced diet do offer some promising benefit on mind health. On the other side, there are tons of studies that support and validate the benefit of Ayurvedic herbs for boosting mind health in all its hues and spectrum. Simply, if you have never used the Natural Herbs for mind health, you are serious missing some blessings of nature. I can't put it more strongly than this. YES, I CHOOSE Natural Herbs for Mind Health! This herbal Supplement is a blend of safe and proven herbs that helps to strengthen your nerves, brain and nurtures a predisposition that is conducive to peace of mind, focus, relaxation, better memory, reduced levels of stress, nervousness and low mood. YES, I am Ready to Benefit from These Wonderful Herbs for Mind Health! WHAT IS THE PACKAGING OF MY JOYFUL MIND? My Joyful Mind comes in two packagings. Bottle or Box. One box or bottle contains 60 Tablets of 1000 mg each. HOW SHOULD I TAKE THIS HERBAL SUPPLEMENT FOR MIND HEALTH? Generally, any adult person over the age of 16 can take two tablets daily. It can be taken with water or juice or milk, after breakfast, after lunch, or after dinner. Sometimes, when a person is taking it either under Dr. VikramAditya or his team's guidance​ or other qualified professionals, one can easily take 3-4 tablets daily. HOW LONG CAN I TAKE MY JOYFUL MIND? My Joyful Mind is perfectly safe combination of Ayurveda herbs. It is a kind of Universal herbal supplement. You can easily take it continuously for 3 months, 6 months or 1 year. There is no problem if you take these nootropic (brain tonic) herbs regularly. I have used this wonderful supplement for myself and have suggested to many friends. It works great to boost my focus while keeping me relaxed and stress free. Many chronic disorders of all sorts are having increased stress as one of the causative factors and also as triggering factors. Yes, the triggering factor for chronic disorders. The chronic disorder can be stomach ulcers, ulcerative colitis or crohn's disease, eczema, psoriais, rheumatoid arthritis, SLE, gout, chronic fatigue syndrome, multiple sclerosis, bronchial asthma, chronic backache, pain in neck, tension headache, pms, menopausal symptoms... The list could go on and on. Whether you are able to manage stress with Ayurvedic herbs as My Joyful Mind or through dietary or lifestyle means or a mix of these, you will experience faster relief and recovery in almost all conditions. So, never ignore mind health, if you have some chronic disorder. It should be a priority for you to boost mind health and be more peaceful and composed version of yourself as there is already some nagging problem that you have to take care. YES, I DECIDE to Manage Stress Naturally with My Joyful Mind! Pak J Pharm Sci. 2017 Nov;30(6):2067-2074. Neuroprotective effect of Bacopa monnieri against morphine-induced histopathological changes in the cerebellum of rats. Brain Res Bull. 2017 Oct;135:120-128. BM treatment provides nigrostriatal dopaminergic neuroprotection against MPTP induced Parkinsonism by the modulation of oxidative stress and apoptotic machinery possibly accounting for the behavioural effects. Neuroreport. 2017 Nov 8;28(16):1031-1035. Bacopa monnieri extract enhances learning-dependent hippocampal long-term synaptic potentiation. Neurochem Res. 2017 Nov;42(11):3233-3244. Antidepressant-like Effect of Bacopaside I in Mice Exposed to Chronic Unpredictable Mild Stress by Modulating the Hypothalamic-Pituitary-Adrenal Axis Function and Activating BDNF Signaling Pathway. J Ethnopharmacol. 2017 Feb 2;197:92-100. The Ayurvedic plant Bacopa monnieri inhibits inflammatory pathways in the brain. Heliyon. 2016 Feb 15;2(2):e00068. Beneficial effects of Bacopa monnieri extract on opioid induced toxicity. Evid Based Complement Alternat Med. 2015;2015:717605. Mechanisms, Efficacy, and Safety of Bacopa monnieri (Brahmi) for Cognitive and Brain Enhancement. Environ Sci Pollut Res Int. 2018 Feb 28. Behavioral and neurochemical consequences of perinatal exposure to lead in adult male Wistar rats: protective effect by Centella asiatica. Front Pharmacol. 2018 Jan 30;9:28. Asiaticoside Attenuates Cell Growth Inhibition and Apoptosis Induced by Aβ1-42 via Inhibiting the TLR4/NF-κB Signaling Pathway in Human Brain Microvascular Endothelial Cells that makes it useful in Alzheimer’s disease. Sci Rep. 2017 Sep 6;7(1):10646. Effects of Centella asiatica (L.) Urb. on cognitive function and mood related outcomes: A Systematic Review and Meta-analysis. Neurochem Res. 2017 May;42(5):1354-1365. Neurotrophic Effect of Asiatic acid, a Triterpene of Centella asiatica Against Chronic 1-Methyl 4-Phenyl 1, 2, 3, 6-Tetrahydropyridine Hydrochloride/Probenecid Mouse Model of Parkinson's disease: The Role of MAPK, PI3K-Akt-GSK3β and mTOR Signalling Pathways. Neuroreport. 2017 Jan 1;28(1):23-27.Synergistic combinations of five single drugs from Centella asiatica for neuronal differentiation. Malays J Med Sci. 2016 Jan;23(1):4-14. Recent Updates in Neuroprotective and Neuroregenerative Potential of Centella asiatica. J Chem Neuroanat. 2017 Oct 16. pii: S0891-0618(17)30081-9. Convolvulus pluricaulis (Shankhapushpi) ameliorates human microtubule-associated protein tau (hMAPτ) induced neurotoxicity in Alzheimer's disease Drosophila model. J Evid Based Integr Med. 2018 Jan-Dec;23:2156587218757661. In Vivo Evaluation of Withania somnifera-Based Formulation, Against Chikungunya Virus-Induced Morbidity and Arthralgia. BMC Complement Altern Med. 2018 Jan 10;18(1):9. Withania somnifera root extract alters basal and morphine-induced opioid receptor gene expression changes in neuroblastoma cells, reducing development of morphine tolerance. Biochem Cell Biol. 2017 Dec 7. Altered muscarinic receptor expression in the cerebral cortex of epileptic rats: Restorative role of Withania somnifera. Cytokine. 2018 Feb;102:211-221. Multifunctional neuroprotective effect of Withanone, a compound from Withania somnifera roots in alleviating cognitive dysfunction. J Neuroinflammation. 2017 Oct 12;14(1):201. Withania somnifera as a potential candidate to ameliorate high fat diet-induced anxiety and neuroinflammation. Cell Transplant. 2017 Jul;26(7):1193-1201. Withania somnifera Extract Protects Model Neurons from In Vitro Traumatic Injury. Inflammopharmacology. 2018 Feb;26(1):207-215. Antihyperalgesic effects of ashwagandha (Withania somnifera root extract) in rat models of postoperative and neuropathic pain. Exp Gerontol. 2017 Sep;95:9-15. Longevity and healthy ageing genes FOXO3A and SIRT3: Serum protein marker and new road map to burst oxidative stress by Withania somnifera. Mol Cell Biochem. 2017 Mar;427(1-2):91-101. Withania somnifera as a potential anxiolytic and immunomodulatory agent in acute sleep deprived female Wistar rats. Drug Deliv. 2016 Sep;23(7):2630-2641. Neuro-protective potential of a vesicular system of a standardized extract of a new chemotype of Withania somnifera Dunal (NMITLI118RT+) against cerebral stroke in rats. Adv Exp Med Biol. 2016;928:329-373. Natural Withanolides in the Treatment of Chronic Diseases. J Neuroinflammation. 2016 Aug 22;13(1):193. Aqueous extract from the Withania somnifera leaves as a potential anti-neuroinflammatory agent: a mechanistic study. Curr Drug Metab. 2018 Mar 5. A Systems Pharmacology Study for Deciphering Anti Depression Activity of Nardostachys jatamansi. Bioorg Med Chem Lett. 2018 Jan 15;28(2):140-144. Anti-neuroinflammatory effects of sesquiterpenoids isolated from Nardostachys jatamansi. Neuropsychobiology. 2016;74(2):104-114. Nardostachys jatamansi Targets BDNF-TrkB to Alleviate Ketamine-Induced Schizophrenia-Like Symptoms in Rats. Indian J Pharm Sci. 2012 Sep;74(5):460-5. Protective Effect of Nardostachys jatamansi Against Radiation-induced Damage at Biochemical and Chromosomal Levels in Swiss Albino Mice. Acta Biochim Pol. 2013;60(1):21-31. Cytoprotective effect of methanolic extract of Nardostachys jatamansi against hydrogen peroxide induced oxidative damage in C6 glioma cells. J Nat Sci Biol Med. 2012 Jul;3(2):125-32. Nardostachys jatamansi extract prevents chronic restraint stress-induced learning and memory deficits in a radial arm maze task. Behav Brain Res. 2009 Sep 14;202(2):285-90. The role of antioxidant properties of Nardostachys jatamansi in alleviation of the symptoms of the chronic fatigue syndrome.